Mile Oak maintained their focus and good recent form by dismantling SCFL Division 1 basement boys Worthing United. Craig Anderson was at the double, while Jack Stenning, Joe Hall, Adam Dine and Karl Gillingham also struck as Oak ran out comprehensive 6-0 winners over ten-man Mavericks at Lyons Way. 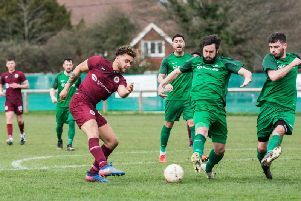 Manager Anthony Whittington has been busy bringing in reinforcements this month, with George Rudwick the latest to arrive from Southwick prior to the clash at Mavericks. And the Oak boss has been delighted with his side’s recent form. He said: “I’m very happy, we played really well. “We won it convincingly - as we should have. Oak got off to a dream start and were ahead inside a minute. Jack Stenning picked out Anderson, who outpaced his marker and fired a right-foot strike into the bottom corner. Stenning was not content with just an assist, doubling the visitors’ lead six minutes later. Dine then delivered a pinpoint free-kick, picking out Hall who fired Mile Oak three goals in front after 25 minutes. It was Dine’s turn to get in on the act three minutes after the restart. Jack Arnold was fouled and Dine stepped up to curl a free-kick home brilliantly. Substitute Patrick Schooley made a superb last-ditch tackle to deny Mavericks from grabbing a consolation as Oak were determined to preserve a clean sheet. Gillingham came on to replace debutant Rudwick and found the net three minutes after being introduced. Another substitute, Jack Marriott, teed up Anderson to round off the scoring two minutes from time. Kieran Deacon showed his frustration in the dying seconds. The Mavericks man was shown a second yellow card for a late tackle on Jack Arnold. Mile Oak are without a game this weekend before returning to action at Midhurst a week on Saturday. MILE OAK: A.Stenning; Early, Arnold, Wedge-Bull, Hall, French, Rudwick, Foster, J.Stenning, Dine, Anderson. Subs: Marriott, Schooley, Livesey, Gillingham, McKenzie.